This recipe makes 8 mini-loaves. In a small sauce pan over medium heat, whisk together 1/2 cup of the sugar and all of the grapefruit juice. Cook and stir until the sugar dissolved - about 3 minutes. Turn off heat and set aside. This syrup will be brushed on the finished loaves. In a medium mixing bowl, combine the flour, baking powder, baking soda and salt. In a small mixing bowl, mix together the vanilla, lemon juice and the half and half. In a large mixing bowl, beat the butter with the remaining 1 cups sugar and the lemon zest until fluffy. Add the eggs one at a time and beat gently until just combined. Add half of the flour mixture and half of the liquid mixture. Use a spatula and mix until just combined and moistened. Mix in the remaining flour and liquid, being careful not to over-mix. Gently fold in the raspberries. Fill each of the prepared loaf cups 3/4 full with batter. Don't over-fill even if you have excess batter. The breads risk overflowing if too full. Bake for 30 minutes until the tops are lightly browned and a toothpick inserted into a loaf comes out clean (no batter sticking). Brush the tops of each loaf with grapefruit syrup. Wait 15 minutes until mostly cooled and then remove loaves from the pan. Brush each loaf on all sides with grapefruit syrup. Let the loaves set 15 more minutes and then enjoy or store for later. For a more indepth look at this recipe (including step-by-step images), please see our blog post titled The Gift Of Bread: Raspberry Grapefruit Mini Loaves. 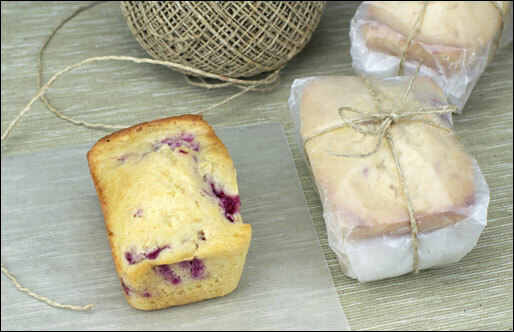 Fresh raspberries, grapefruit, lemon and vanilla in sweet, tender personal mini-loaves. You can also make one large 5x9 loaf - just increase cooking time to 50 minutes. 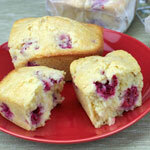 What do you think of Raspberry Grapefruit Mini Breads? We love this bread, only I didn't have raspberries or grapefruit, I had blueberries and orange juice on hand and it came out so delicious!! Recipe is for the baby mini loaves, so for 4 of the larger mini loaves this is the perfect amount. Very good, but I was only able to get 6 loaves. We must have different pan sizes. This would probably make good muffins too. Is there another syrup you could use instead of grapefruit?